Well a lot of the people who questioned the change to the Hornets have been silenced. The skeptics wondered about whether or not our claims of a resurgence of fan support would be validated when the time came. Boy was it! “We’re very close on a number of new sponsorships,” Guelli said. “There are many, many companies that have not been interested for a number of reasons that are entertaining dialogue around the return of the Hornets. 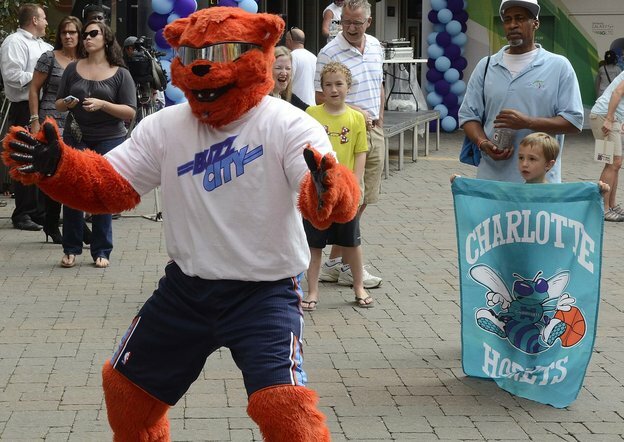 We’ve also been told that the “Buzz City” apparel has 100% turn around in the team store. This is extremely encouraging to see this type of support for this franchise considering that just last year we came in 24th for home attendance when compared to the other teams in the NBA. Now we are in the top 10 for ticket sales in the NBA and the season hasn’t even started yet. Once again we have some more news from “the inside”. This has been told to us by a couple people very close to the rebranding process. They said that at this point in the process a logo has not been chosen yet but they do have 8 potentials for the Hornets. The majority of these and the most popular ones are sticking to original Hugo look but with a little bit more aggressive twist, a more muscular Hugo with “angrier” eyes and expression. Which is refreshing considering the complete “sissification” that happened to the Hornets brand in New Orleans. They realize the value of the brand loyalty and recognition and don’t want to ruin that. Some logos are completely different but are not getting as strong support as those similar to the original Hugo. To answer the question that has been bothering so many people. Pete Guelli also said that they have not finalized a color scheme but for the time being are using the Carolina Blue for legal reason not yet fixed with the league. Now our source has stated that most of the design proposals are sticking with the TEAL & PURPLE as the main colors and may use the Carolina Blue for small “details”. This will give them ability to make more apparel designs. Again this is all hearsay. Take all this with a grain of salt. ← Cam Knows The Buzz!